MarksBlackPot: Dutch Oven Recipes and Cooking: Preparations for the Big Dutch Oven Meal on Thanksgiving! Preparations for the Big Dutch Oven Meal on Thanksgiving! 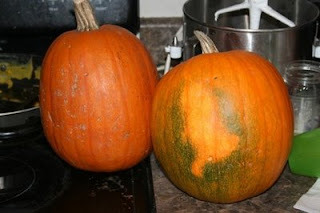 Last year, when I made that pumpkin pie, things were different. First of all, I did it right around Halloween, not around Thanksgiving. So, I was a little earlier in the year. Second, I remember the stores carried the small pie pumpkins all the way through the Thanksgiving holiday. The practical upshot of these two factors was that I was having a very tough time finding pumpkins to make my pie out of. I went from store to store, on a holy and sacred quest for the most sincere of pie pumpkins. I searched grocery stores, farmer's markets, nuthin. I had pretty much resigned myself to not doing it this year. I was more than a bit bummed by that, because I'd looked forward to it all year. So, today, I took a different route to work, and drove past one of those little farmer's produce stands, and I saw them! I was so psyched! I almost left rubber on the asphault, I was so excited. But I pulled over and bought these to marvelous specimens for only a buck. You can't get much better than this! 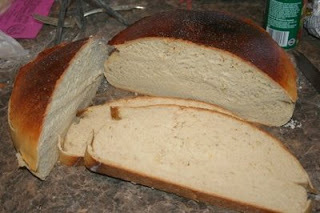 Oh, and here's a picture of some bread I baked the other day. I would have posted about it, but my computer was down. It still is, in fact. I'm writing this on my son's. Not convenient, but it works. It was really good bread. I was trying out this new procedure I'd found in this book that talks about taking the yeast and letting it proof with some hot water and flour for about an hour or so, before you start adding the rest of the flour and the other ingredients. I'm going to do it again really soon, and I'll step through it in more detail for you all. Happy Thanksgiving!!! Go for the orange stuffed Turkey, it really makes a difference. I always use Webers Orange stuffed Turkey recipe and it never fails. Can't wait to hear about your brine also!